DepEd's K to 12 is like a "band-aid on a gunshot wound". The new curriculum has been designed with short instructional hours to allow for multiple shifts in schools. With shortage in classrooms, squeezing more students into one room is the solution provided by the new curriculum. Incoming education secretary Briones is correct in stating that major changes have taken place in the past four years in preparation for the new curriculum. Not only are instructional times shorter, but there is also a spiral curriculum implemented in all subjects. Biology, chemistry, physics and earth science are all taught each year in high school. The same goes with mathematics. 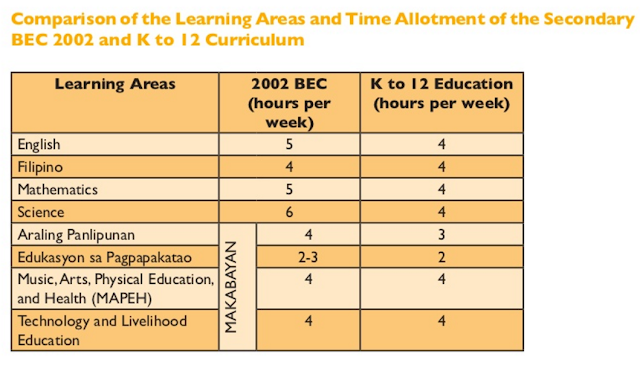 For these reasons, DepEd's K to 12 is not just a "band-aid on a gunshot wound". Worse, it is an infection on a gunshot wound. It is a wrong solution that will only create new problems. We could only hope that secretary Briones does good with her promise to examine and monitor basic education in the Philippines. 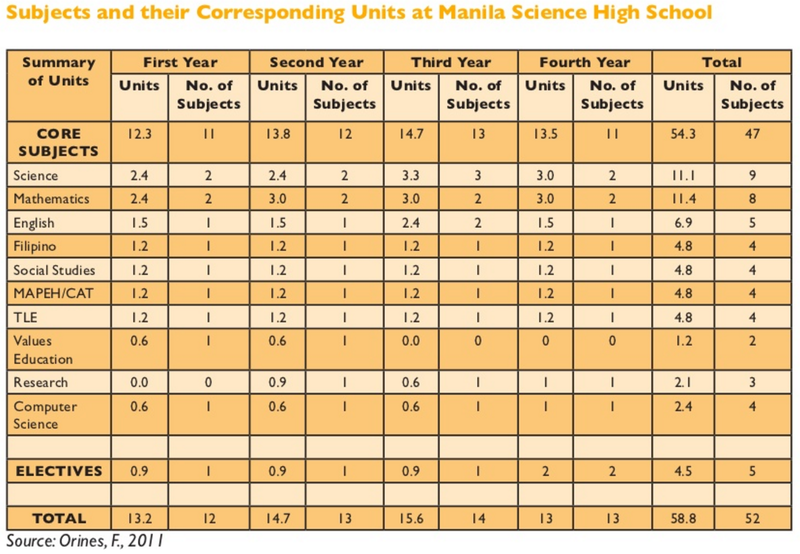 Only 17% (about 300,000 of the expected 1,800,000 students) has enrolled in senior high school. Assessments are required to see the effects of the spiral curriculum. Learning materials are largely unavailable and if these are provided, these are riddled with serious errors. The “worst case scenario,” however, said Atillo, is that the remaining classrooms under construction will not be finished by August this year. He said that 935 classrooms are still being constructed, while 452 have already been established, adding that 482 classrooms are to be ready by June 13. “We discussed this matter with the local DepEd head and the ten DepEd divisions in the area and they each have their own solutions,” he said. Compostela Valley, he said, will use LSB-funded buildings if they will shift junior high school classes, and Davao City will borrow classrooms from adjacent elementary schools with extra rooms, and principals’ offices will be utilized as well. “They will utilize gymnasiums and barangay gymnasiums if need be,” he said. However, he emphasized that this will only be a problem until August, based on the confirmation by the contractors and the Department of Public Works and Highways (DPWH) that “they will really complete the remaining classrooms” which are still under construction. 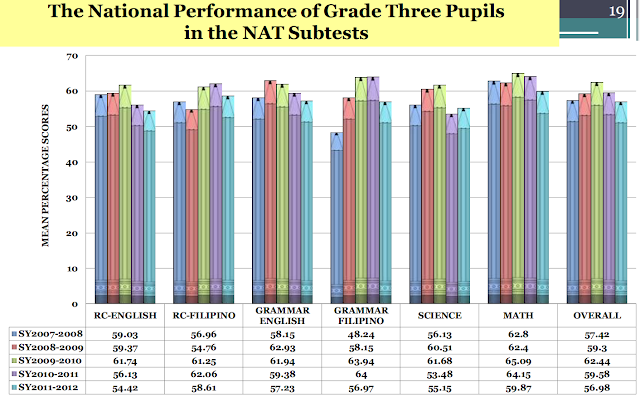 Like a band-aid, DepEd's K to 12 tries to hide the dismal shortage in resources. It is easy for people to see the additional two years in high school. It is therefore not surprising why protests against the new curriculum have only become visible recently. The other changes have already occurred but it takes much more than a glance to see what DepEd has done to Philippine basic education. 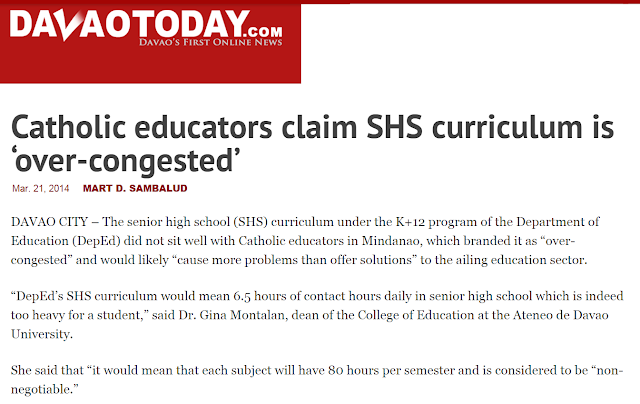 Here is a repost of an article that lays out how DepEd's K to 12 tries to cheat its way out of the classroom shortage problem. Congestion means overcrowding. In simple terms, there is too much in too little space or time. To avoid congestion one can either increase space or time, or reduce whatever is taking space or time. In introducing K to 12 to the Philippines, the Department of Education made the claim, "...the sad state of basic education can be partly attributed to the congested basic education curriculum." 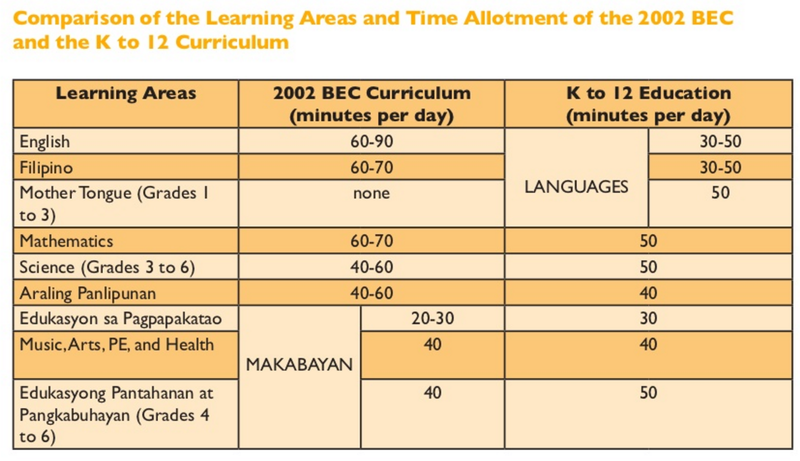 A closer examination of DepEd's K to 12, however, reveals not a decongestion, but a reduction of instructional hours across the first ten years of education. Here, the decrease in instructional hours is even greater. Science, for instance suffers a 33 percent reduction. Adding two years to basic education may indeed look good on paper as a way of decongesting the curriculum. However, if the first ten years of basic education lose one third of instructional time, the senior high school years only mean catching up. One can think in terms of traffic, reducing instructional hours is the same as closing roads. Is this really a way to decongest? In my fourth year, I was taking two separate math subjects. One is an introduction to Calculus and the other is Linear Algebra. I was also enrolled in two separate science subjects: Advanced Chemistry and Advanced Physics. In addition to these, I had Social Studies, Pilipino, English, Retail Merchandising, Citizen Army Training, and Physical Education. 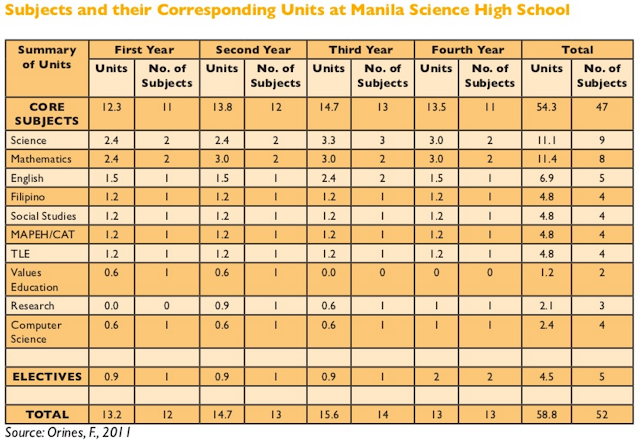 Without the special science curriculum, other high schools only had one math and one science subject per year. Thus, it is quite clear that the following is not true: "the sad state of basic education can be partly attributed to the congested basic education curriculum." The reason is simple, the curriculum is not congested. Vargas is saying that there is a considerable amount of homework and school children are forced to stay up all night. Vargas also laments that he is not hearing from other parents. 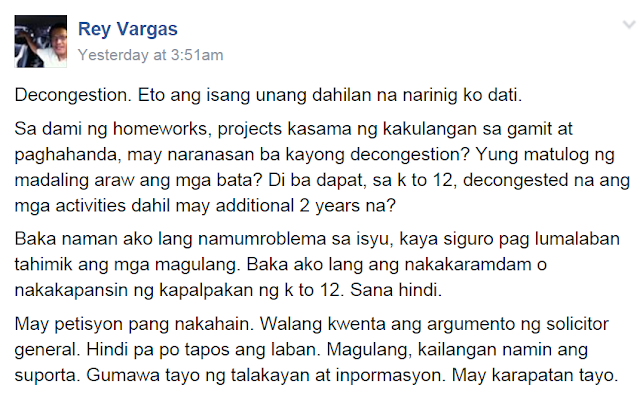 Vargas hopes that he is not the only one who is seeing this problem. Do parents still care about the education and well-being of their children is perhaps one question in his mind. The math behind decongestion is really simple. 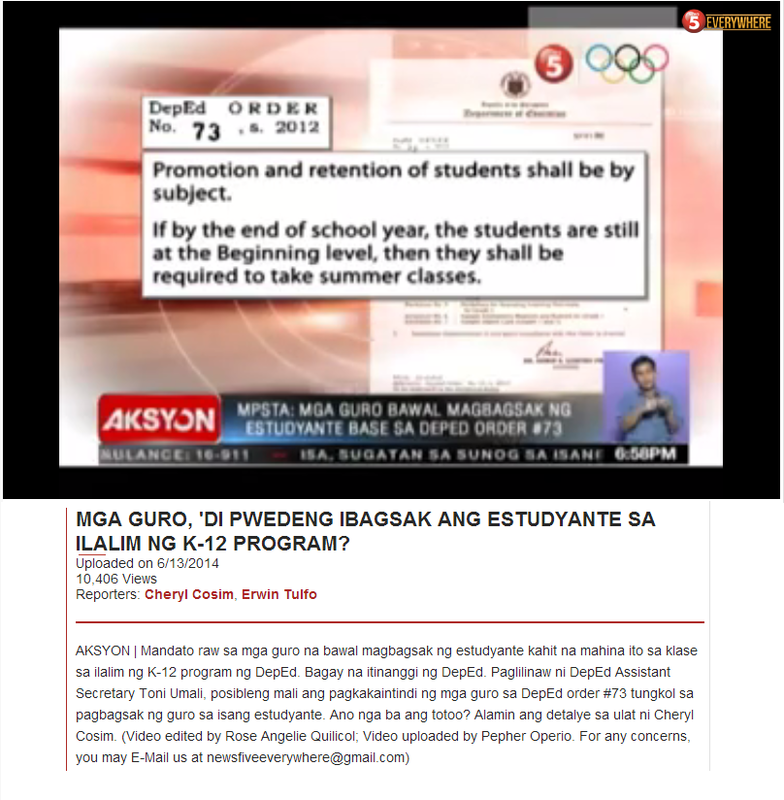 And clearly, DepEd is using the term only as a sound bite. We could only hope that incoming DepEd secretary Briones truly takes a hard look at DepEd's K to 12. It is not really just the two additional years that are bad. 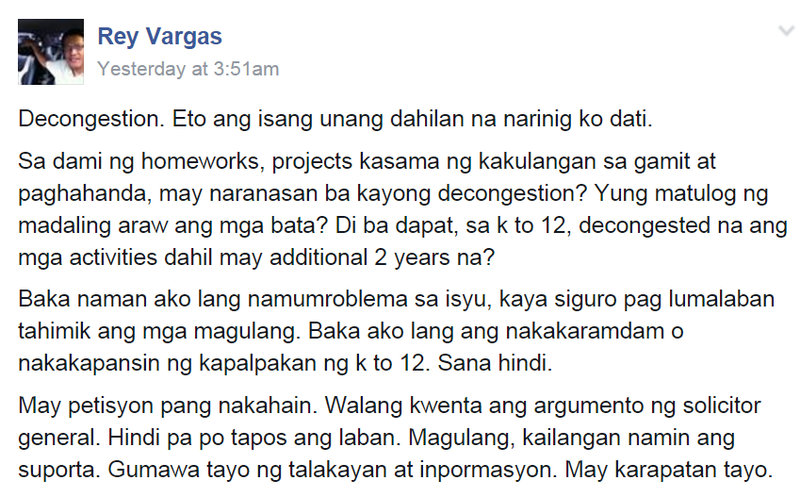 DepEd's K to 12 is bad for so many other reasons.